Established in 1947, Ramapo Valley Ambulance Corps or better known as RVAC, was the first Volunteer Ambulance corps in the town of Ramapo. Although the area has undergone much change in the 64 years of RVAC's existence, the purpose of the organization has remained the same; to provide the best pre-hospital care possible to our community. 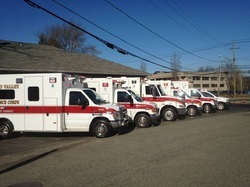 RVAC currently has 5 ambulances and 1 flag car, allowing our volunteers to provide emergency care at the EMT-B level and higher. Measuring in at approximately 34.5 square miles, RVAC covers the largest area Rockland County. The NYS thruway, Kakiat state park along with the communities of Airmont, Montebello, Suffern, Hillburn and Wesley Hills are just some of the areas covered by Ramapo Valley. Corresponding to our large coverage area, our population (as of the 2000 census) is 40,142. This accounts for the growing number of calls that have been received, with 2013 approaching 3,400. Because RVAC is a not-for-profit, Volunteer organization we are constantly looking for new members. Positions as EMT-B's, Drivers, CPR instructors and Youth-Corp members are always available. RVAC also needs the community's help in supplementing our budget with donations. these donations allow us to offer extra classes to the community and procure state of the art equipment for our volunteers.